The Wet Erase Pens Come in Other Colors, Like Yellow and Blue. 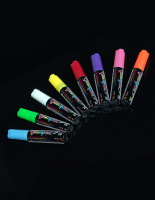 These Erasable Markers are Great for Writing Bold Letters on Signage. The Wet Erase Pens are Easy to Clean up After Just by Using a Damp Cloth! 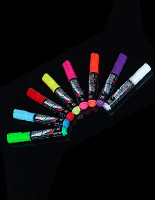 Quick-drying liquid chalk with an even flow is great for making attention-getting displays. 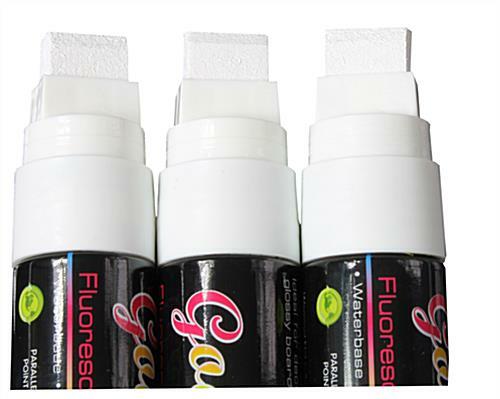 White writing sticks are available for purchase in packages of (3) for added convenience to customers. Water-based ink wipes completely clean using a damp towel for fast changes to specials. 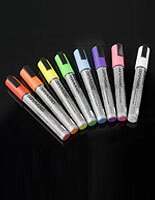 The wet erase pens that have a 5/8" tip are for home and business use. Some of the places that use these writing utensils are retail stores, cafés, classrooms, bars, and other spaces. These bright sticks are wet erase pens that are made to be used on non-porous surfaces, like windows, glass panels, white and blackboards, and more materials. 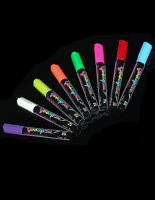 Another great aspect of these writing stick is that they can be used on write-on LED signage. The white wet erase pens have writing that will glow when placed on illuminated displays to make a mesmerizing presentation. 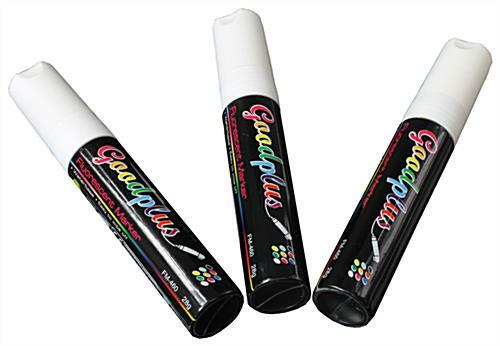 The liquid chalk tools have writing that dries quickly in order to prevent letters and images from running. These wet erase pens are water-based and will easily wipe clean from the proper surface using a wet towel. The ease of use of the markers allows users to change messages however often they prefer. 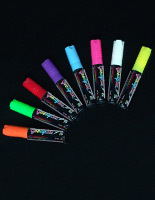 The bright sticks, wet erase pens are only recommended for indoor use because rain will wash away any messages or pictures drawn with them. 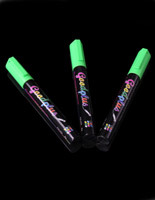 Unlike standard chalk, these neon writing tools do not leave a fine dust on everything around them. The wet erase pens are set for purchase in packs of 3. With three pens of the same color, users will not have to worry about running empty on ink.